Don’t miss out! Only ten days to go to the Transition to Adulthood – Mental Capacity Act seminar for parents carers and professionals on 13 November. Her Honour Judge Hilder, Senior Judge of the Court of Protection will be speaking about the COP and how it works. 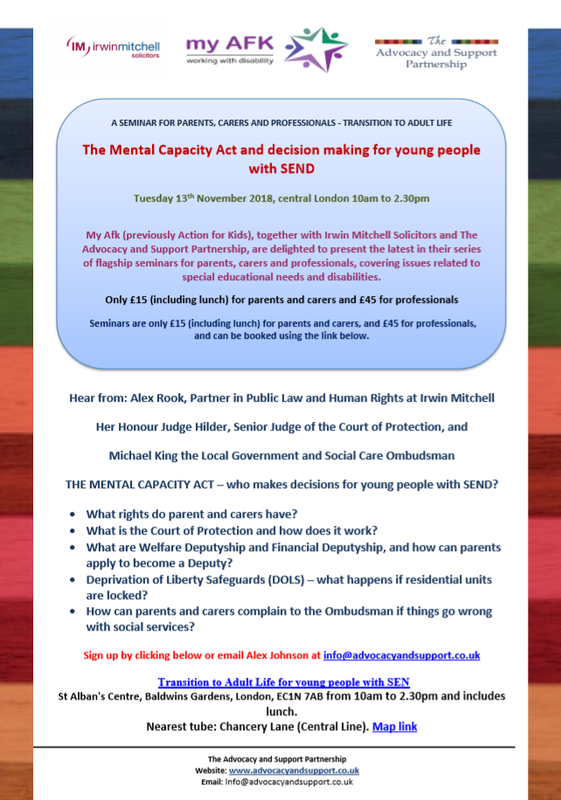 Top lawyer Alex Rook will talk about the Mental Capacity Act and what it means for young disabled people and adults, and in addition, the Local Government and Social Care Ombudsman, Michael King, will talk about the ombudsman – what he does and how he can help parents of disabled children. The updated leaflet is attached and also here. Please pass on to other parents and carers. Book your place using this link here.